St. Helena: The delays continue to continue at Robert Simon's AKA in St. Helena, with the new ETA being either this weekend or next, but that's not what we want to discuss right now. 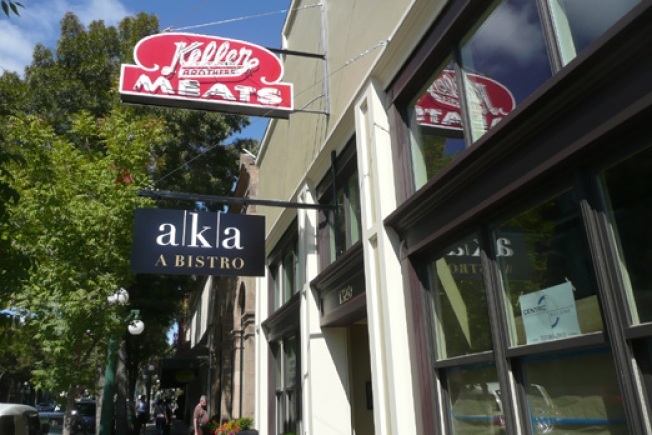 Allow us to point out the curious signage situation at work directly on Main Street St. Helena, which is also Highway 29, which is the main thoroughfare for most things Napa Valley: the bistro is keeping the old Keller Brothers Meats sign front and center. A bit of background: when he first took over the Keller market space (unrelated to Sir Thomas Keller), Simon—who also owns Bistro 45 in Pasadena—originally wanted to incorporate the Keller name into the bistro's name (Keller's Bistro, perchance? ), but naturally, Team Thomas Keller's lawyers objected to this ridiculousness. Thus, the current moniker of AKA, a Bistro. However, you'll notice that even though the name is technically absent, the Keller sign remains, and just below it, the AKA sign. Now, it's obviously not as blatant as the Wolfgang Wars in Beverly Hills, but we're still calling shenanigans on the bistro branding cop-out. It's one thing to pay homage to one's predecessors, but quite another to keep names around solely for the sake of name recognition, especially when the name is that of Keller ... and you just happen to be in Napa Valley.